I don't recall ever enjoying Autumn days the way I enjoy it this season. I find myself constantly drawn to the outdoors, not wishing to stay confined within four walls. All I saw in the past was a world painted in brush strokes of rust, but slowly I started seeing the yellows and the reds popping through, weaving a cozy blanket of beautiful, warm autumn hues. The crisp, humidity free, cooler weather. The walks Wizzy, our indiscriminate food loving pooch, forces on me, all healthy, though I do begrudge him for interrupting me. A couple of weeks back, on such a Fall morning, I attempted antiquing in the countryside. My efforts proved to be futile. Potential food photography props I was seeing in the charming antique shops brought about images of vintage laundry wash boards and chamber pots. My imagination was running amok, especially when my GPS was dumbfounded and the road I was on was not showing up on Siri's radar. Panicked, I scurried back home. My antique wanderings of sorts were an utter failure. I like to know my destinations. Jonathan likes to get purposely lost and experience the unexpected adventure. Once, on such an Autumn day, I imagine, though it might have been a different season altogether, we wandered off. Just off the Susquehanna River, by the pristine long bridge, in Maryland, and came by a deserted army base. It was surreal in the eeriest sense of ways. In a nuclear holocaust of epic proportions end of the world circumstances of ways. Jonathan's eyes, on the other hand, were sparked with curiosity and excitement. His mannerism relaxed as if we were on a beach vacation. I, worry what's lurking behind the veil of the unknown. If I do wander off on my own, chances are I'll stumble into something odd. It is proven! While my imagination is running ahead of me, I savor the everyday, little things that sweep me with the purest of pleasures. The strands of grass trying to reach for the sun through the blanket of reds, golden yellows, and yes, RUST. The Joy of Autumn. In celebration of Autumn I let the seasonal vegetables in this soup shine. While I like the purity of flavors in this soup, you could most certainly use it as a canvas. Drizzle chili oil just before serving, swirl in a puree of sautéed peas and onions, or swirl in just a touch of basil pesto. A nice change from the gourds for Thanksgiving. In a large pot on a low/medium heated oil sauté onions, celeriac, cauliflower and garlic, while occasionally mixing, for a few minutes until the onions soften. Add the potatoes and continue sautéing for a few minutes longer. Add water, white pepper and salt and bring to a boil. Turn down heat and let simmer on a low bubble, while occasionally stirring, for about an hour, while the lid is covering the pot but slightly ajar. Taste and adjust for salt. Let it cool a tad and puree with an immersion blender. If using a blender or a food processor, I would let the soup cool almost completely before pureeing. If making ahead, keep in mind the soup will thicken quite a bit because of the starch. Can be made ahead and frozen. The recipe can be doubled easily. Heat up oil in a frying pan on medium/high heat. Add the shallots and crisp until brown. 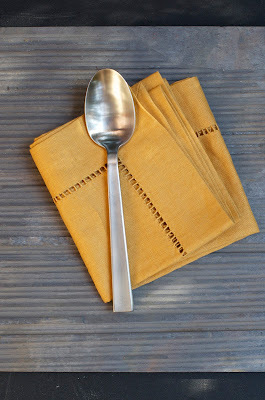 Scoop with a slotted spatula into a paper towel lined plate. Make sure the crispy shallots are separate laying flat. Crisp the shallots just before serving. P.S. I might do another photo shoot but couldn't wait to get this out to you! I am GOING to find celeriac root! I have been seeing soup made with this a few times this Fall. I am with you.. I love the experience of new surroundings and broken down old buildings.. but definitely when someone else is at the helm. I have to wander with a body guard.. I just get too freaked! I loved this whimsical post about Autumn...and great dish to reflect it! I was sold when I saw celeriac...love the stuff. I totally see what you mean by the soup being a canvas. A tasty soup! I love eceleriac. I have never tasted celeriac but your soup looks perfect. I too need to find 'Celeriac' now..first thing first..how does it look like? Love the moody description of autumn and your feelings, Shulie. TY Sanjeeta. In first link at the end of the post there are photos to celeriac. So beautiful!!! 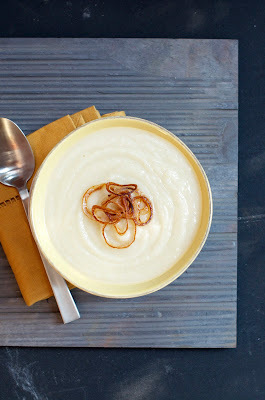 I love the crispy shallots topping this amazingly creamy looking soup without cream :) Perfect for this cool, rainy day. It's finally raining here (a little bit) and your soup would definitely be great for this weather. thank you for stopping by on my space. I have been trying to find celeriac for so long. You soup looks so delicious and love the topping! look forward to read more from you. Love the crispy topping. Soup looks so inviting and warm. Just apt for the rains here. This soup makes me feel all warm and cozy inside. And have I mentioned that I'm loving the site redesign! Woot! Aww TY Bri about the redesign too. Working on the banner now. You are making wish we had more proper seasons out here, I'm craving the beautiful fall colors! I've never tried celeriac before and now I want too!! Especially with this recipe and now that Florida is slightly cool enough for soups! I agree, I used to have trouble seeing the shades when I was younger but with the years I realized the beautiful orange red yellow colors. Maybe thats because I have been already for a while away from europe and the change made me open my eyes. The crispy shallots are a perfect topper for this soup!